So the new Gems have been announced, and the Life buffing Emerald gems have been introduced. 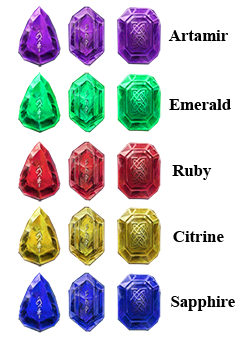 But for the Ruby, Sapphire and Citrine gems, we are still in the dark, although it seems safe to guess they will each buff either attack, attack debuff, or life debuff like the Emerald Gems. Concerning the Emerald gems, I have seen up to lvl IV right now, while the rest of the levels in the Gem Embedding article are hypothetical for the time being. So my question is, if you have any more info on the higher level gems stats, feel free to post them here and I will add them to the article. Thanks! This entry was posted in Blog and tagged artamir, citrine, emerald, gem, gems, kabam, kingdoms of middle earth, KoM, ruby, sapphire by beardmonkey. Bookmark the permalink. With all the Foe Life Debuffs, is Void/RA still the best defense, or will extra life help more? no they dont. First level is always different, just look at Artamir gems as well. All the info is contained in the Gem Embedding article. The citrine gems are life debuff gems. What world was this from? It doesn’t seem to be available on my world, and I don’t see any information on the forums yet, either. In any case, thanks! It’s interesting to see that the percent buff isn’t the same. For some reason, I had thought maybe the buffs would be _weaker_ not stronger… but oh well. yeah only the emerald gems have been introduced on my server 91, the rest is partly speculation. I dont like the gem system at all, as the exponential percentages only widen the gap between players, which will lead to TK tournaments, one of the core features of this game, tedious and boring, as literally noone but the biggest spenders will open up and everything needs to be arranged….it was much more fun when we didnt have gems and high level gear. Felt more like a competition, now it feels like a spend-a-thon…..